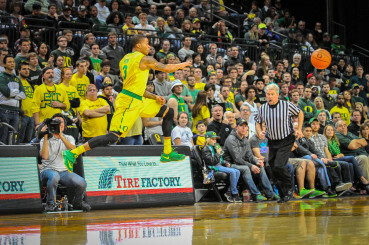 The Oregon Ducks men’s basketball team returned to Matthew Knight Arena to square off against the Washington Huskies on Wednesday evening, and came out victorious with a thrilling 78-74 triumph. The Huskies (14-8, 3-7 Pac-12) entered the night on a slump, losing three of their previous four games. On the other hand, the Ducks (16-7, 6-4 Pac-12) came in on a much more positive note, winning three of their previous four games, including an overtime nail biter against Arizona State last week. Wednesday evening marked the 299th meeting between these two basketball programs, and both teams were eager to out-duel one another. The 5,866 fans that packed Mathew Knight Arena didn’t faze Washington. In fact, the Huskies’ leading scorer, Nigel Williams-Goss, was aggressive from the get-go and he was determined to silence the home crowd. He put up four early points and Shawn Kemp Jr. joined in on the fun by adding four points, as well. The Huskies used a ton of misdirection and motion in their offense to confuse Oregon’s defense in the early going, and the Ducks found themselves in the wrong place at the wrong time on multiple defensive possessions. The various driving lanes that the Huskies’ offense created enabled them to get to the rim and 12 of the Huskies’ first 13 points came in the paint. On the flip side, Oregon had a hard time generating easy looks. Washington’s 2-3 zone was exceptional and it prevented the Ducks from getting to the rim; however, despite the fact that most of Oregon’s looks came from the perimeter, it didn’t matter. The Ducks were scorching offensively, and their leading scorer led the way. 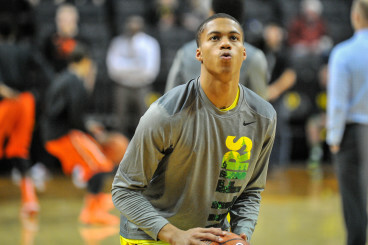 Joseph Young accumulated 11 early points, and as a team, the Ducks were 4-7 from downtown midway through the first half. Joe young showed off his scoring abilities by tallying 32 points and hitting another game winner. If someone were to explain what transpired during the first 20 minutes of the ball game, it would most likely come in the form of one simple, yet exciting word: offense. The Huskies’ execution in the first half allowed them to connect on 56% of their shots, and Williams-Goss and Andrew Andrews combined to score 18 points. However, the Huskies weren’t the only ones who had fun. The Ducks’ jump shooting abilities enabled them to shot 57% from the field and Young finished the first frame with 15 points and three rebounds. Heading into the half, the Ducks led the Huskies 42-37, but with the way that both teams were shooting the basketball, they should have elected to stay on the court. Oregon’s five point lead quickly vanished as the second half got under way, but the 15 minute intermission didn’t seem to cool off the Huskies. Washington scored four quick points to pull within one, but that quickly culminated to an 8-0 run, and it was eventually pushed to a 13-2 run. The Ducks couldn’t match the Huskies hot start, though. They missed their first six shots of the second half, and for a brief moment, it looked like Oregon’s magic had disappeared. Despite the fact that many Pac-12 critics expected Oregon to under-perform this season, its leading scorer has never taken “no” for an answer. 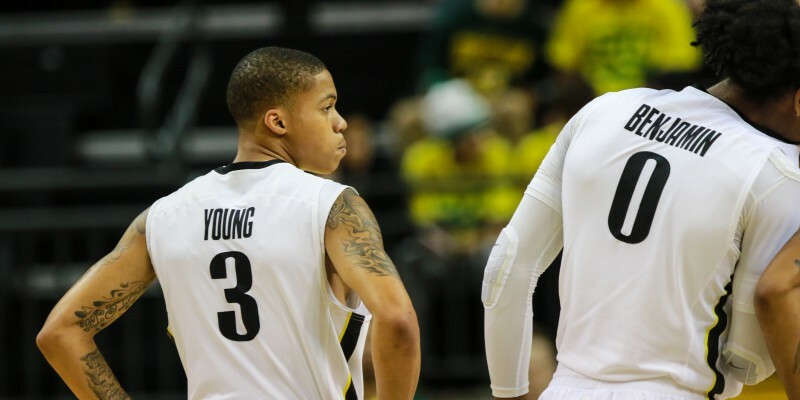 Although Oregon got off to a slow start in the second half, Young’s presence on the floor kept everything intact. The senior guard took it upon himself to keep the Ducks in the game and he responded with buckets each and every time Washington scored a basket of its own. The second 20 minutes of the game featured 10 ties and four lead changes, but the high pressure minutes had no effect on Young’s composure. Coming into the game, the senior guard needed only 30 points to reach the 2,000 career point mark, and with about two minutes to go, he hit a go-ahead jump shot, which not only gave the Ducks a 72-70 lead, but also gave the high-scoring guard his 30th point of the night and the 2,000th of his career. The high-scoring guard has officially scored over 2,000 career points. After a few traded baskets, the game was tied once again. The Ducks had possession of the ball with 42.5 seconds left in the game, and everyone in the building knew who the ball was going to. Young dribbled the ball at the top of the key and with the clock winding down, he drove to his left and hit a pull up jumper, which gave the Ducks a 76-74 lead and they never looked back. Young finished the game with 32 points, two assists, three rebounds, and for the second straight week, another game winner. While Oregon’s senior guard is known across the country as a great scorer, he mentioned after the game that he doesn’t worry about scoring points. He said he only has one goal. The Ducks are now victorious in four out of their last five games, and if they continue to improve as the season winds down, they will be a team that no one will want to play in the Pac-12 Tournament next month. Oregon will look to continue its winning ways as it hosts Ernie Kent and the Washington State Cougars this Sunday at Matthew Knight Arena.